Scott Colosimo runs Cleveland CycleWerks, a company making cool, affordable custom-style bikes that cost as little as $3195. 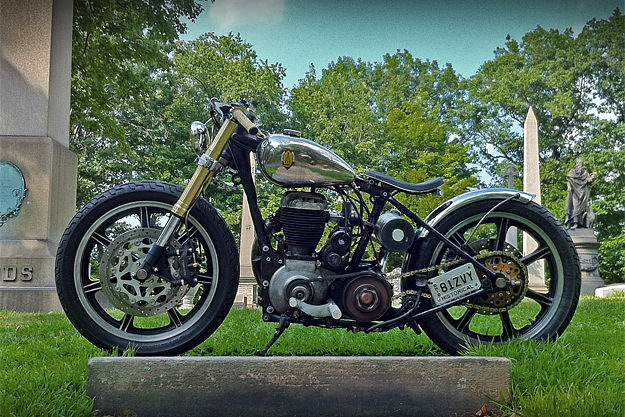 This bike isn’t on a CCW dealer floor though: it’s Scott’s personal ride, a 1954 BSA M21 that he built himself. Scott wanted a hardtail, cut down to the essential elements that make a bike stop and go. “A modern take on a British classic,” he says. So he bought this bike sight unseen from eBay, assured by the owner that it was a “real rider”. In reality, it was worn out and unsafe. 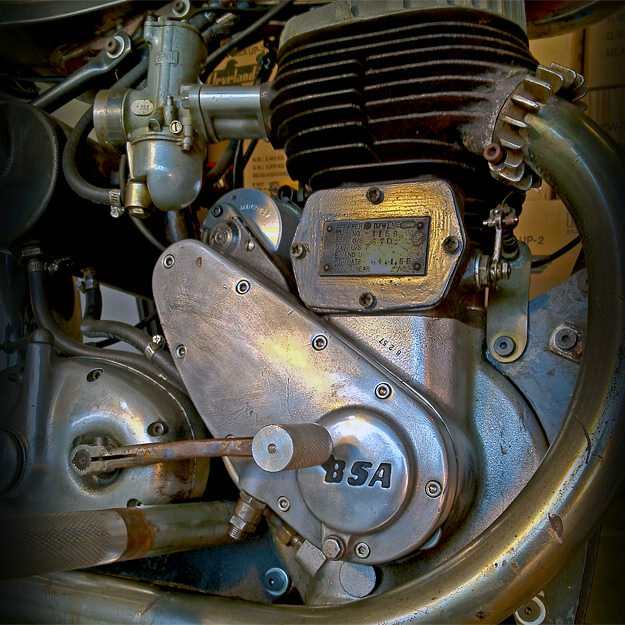 Scott stripped the BSA down and sketched out his vision. Then he went to work to fix the 60 years of bad craftsmanship and chopping that had been inflicted on the frame. Then the mechanicals were overhauled: the gears were dog-eared so the teeth engage easier, the motor was disassembled, inspected, cleaned and re-assembled, and the exhaust was massaged into a better sweep and position. Scott tried fitting 21” wheels front and rear, but “it just looked like some sort of horrible joke”. 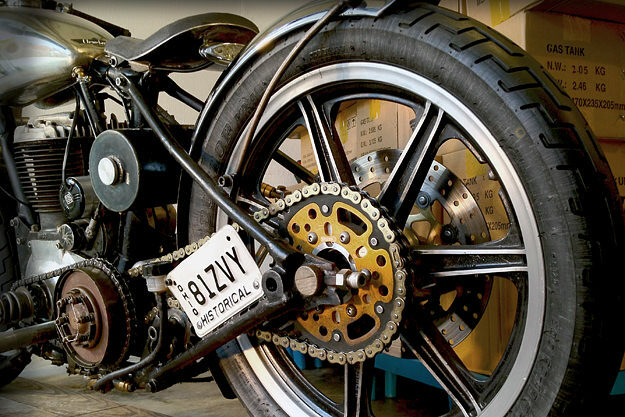 So he opted for two XS650 19” front wheels, fabricating components so that the drive gear would work for the rear wheel. The forks are from a GSX-R1000: Scott wanted a beefy front end to go with the beefy stock frame. That meant lathing some bearing cups, making a left/right steering stop, and fitting a steering stabilizer. The rotors are GSX-R600 at the front and GSX-R750 at the back. Brake lines are custom, with a custom distribution block made to split the lines at the triple trees. The mid-controls are modified versions of CCW’s production forward controls, and the taillight is a modified CCW LED item. The only real “new” component is an Elswick Cycles oil can; the rear fender and headlight were spare parts that Scott had lying around the shop. “This bike was built to ride,” says Scott. “It’s raw, it has dings, it’s been dumped and ridden hard.” All the fabricated parts were left raw, with the exception of the paint on the wheels. However, there’s none of that attitude on the production bikes Cleveland CycleWerks sells throughout North America (and Europe and Japan). 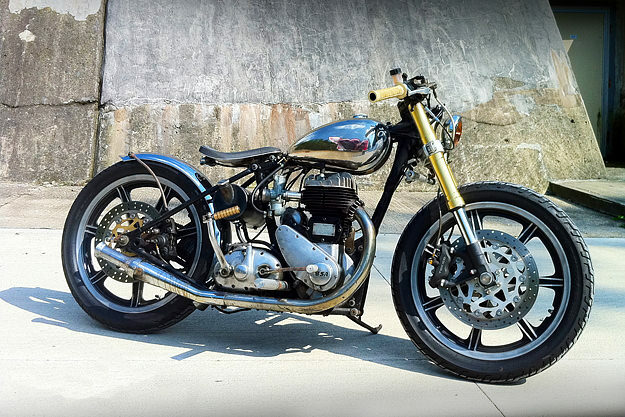 Even if a raw, grungy BSA is not to your taste, take a look at the CCW range, and the Misfit in particular—229cc of stylish, retro-inspired fun. 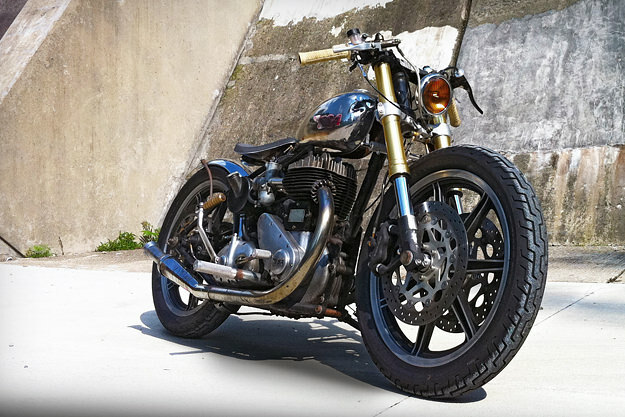 It’s the kind of bike to get new riders enthused about motorcycling, and that anyone can use to zip around town.